Awhile back I did one of the darnedest things. You may recall. I made this root beer float. And I’m still trying to decide if it was the best decision of my life, or the catalyst to having nightmares when I envision warm, sandy beaches and waves crashing along the shore. Along with bikinis. Root beer floats and bikinis don’t go together. Did you know that? Let me rephrase that. Daily root beer floats and bikinis don’t go together. Unless you’re a freak of nature. Even though root beer has never really tickled my fancy, I’ve developed something that some may call an… addiction. It hurts to say it out loud. For someone who has never found a thrill in drinking carbonated beverages, all I can think about is cold, bubbly root beer twenty four seven. It tastes so good when it hits your lips. See that frosting up there? It’s a bit ridiculous. The vanilla frosting tastes like vanilla ice cream, and that little guy? That little bowl is filled with root beer frosting. I’ll say it again in because I can’t really believe it either. I don’t want to lead you astray, so I’m going to tell you a little secret. We’re friends right? You’ll understand. The root beer flavor doesn’t come from just root beer. I’m sorry… but it just isn’t possible. I tried. And tried again. And drank lots of half-poured bottles of root beer in between. And even added some ice cream down inside the bottle. Kind of like how you add a lime slice to a Corona. But better. Then I tried some more. And well, I eventually could taste a little twinge of root beer, but it just wasn’t doing it for me. I don’t think it would do it for you either. It was then that I caved. I flew to the store in a frenzy, with flour dusted on my sweatpants and a fresh vanilla extract moustache. Contrary to what Mr. How Sweet may tell you, I did not fly there on my broom. I made my way to the spice aisle and spied what I’ve longed to pick up in the past, but could never bring myself to shell out the $6 for: root beer concentrate. Don’t be scared, friends. It is a good thing. A very good thing. However, perhaps now is when I should mention that one should not taste root beer concentrate on it’s own. Don’t do it. I am not sure that I have ever ingested something so foul, with the exception of the broccoli stalk I accidentally bit into on Friday afternoon. It’s time to talk cupcakes. There was a time in my life when I thought bacon and chocolate cupcakes reigned supreme. This was a very long time ago; almost two months to the day. Clearly I age in light years. Then I made hot fudge peanut butter stuffed cupcakes. And let’s just say… they literally took the cake. Or so I thought. But these beat them all. Silky, dark chocolate cake that crumbles when you take a bite, enveloping a spurt of fizzy root beer frosting. Yes, I said fizzy. I can not tell a lie. I don’t know if it’s the root beer concentrate or if my local grocery store started carrying hallucinogenic mushrooms, but we all agreed that this cupcake fizzes like your traditional root beer float. Top that off with a big cloud of fluffy vanilla ice cream frosting, and you’re good to go. Well, anywhere except for the beach I suppose. In the bowl of an electric mixer, cream butter until smooth. On low speed, add powdered sugar one cup at a time, increasing speed to bring the frosting together. Add milk and vanilla extract. Beat until smooth. Remove almost all of the vanilla frosting, leaving behind about 1/3-1/2 cup in the mixer. Set vanilla frosting aside. Add root beer concentrate to remaining frosting in the bowl and beat until it comes together. Prep two pastry bags (or you can simply use spoons) and fill one with vanilla frosting and the other with root beer frosting. Once the cupcakes have completely cooled, fill each one with root beer frosting (I simply plunge the pastry tip into the cupcake and squeeze), then top with vanilla frosting. Top with hot fudge or cocoa syrup. I think this calls for an extra year hour on the treadmill. wow. i pinned a few different root beer float recipes to try for my son and my nephew’s birthday party tomorrow. I began by following a recipe that required me to create root beer syrup by boiling it down. The cupcakes that followed were nothing to write home about. 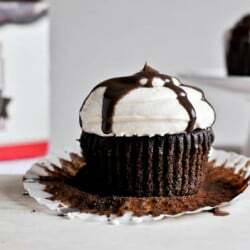 :( I knew I needed a really good root beer buttercream to top them off; i found this, and, just, WOW. For the batter….do you use a mixer or a whisk? Looks like the next best thing to beer, bacon and bikinis! Could you make this recipe without cocoa powder? I was wondering if root beer concentrate is the same type of concentrate that they use for soda stream etc?